Plush Pacifier Holders ~ My Baby Sleep Guide | Your sleep problems, solved! lovey (as is the case with my son Jacob). 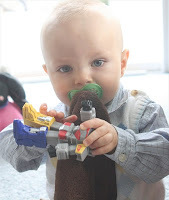 Some people will detach the pacifier from the plush toy when baby gets older and is no longer using the pacifier but still wants to use his plush lovey. Keep in mind that these don't work well with all young babies. Sometimes the pacifier will fall out of baby's mouth regardless. This problem is often fixed with a little time. If you use these, I suggest you buy a couple of them (I always keep three on hand--I like to play things extra safe!). You do NOT want a baby's lovey disappearing with no backup in sight! Also, double check that the pacifier holder will work with the pacifier you are using. 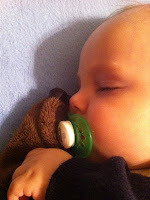 Most things that work with a soothie pacifier don't seem to work with much else, and vice-versa. Wubbanub Plush Pacifier- These are one of the more popular holders with a soothie pacifier attached to it. It does not come unattached. These are even used in some hospitals. They come in absolutely adorable animals. The angle of the pacifier and hinge is one of the best ones I've found for newborns. It stays in baby's mouth better than some others. Pacifier doesn't detach so it won't come off and get lost, but at the same time it can make cleaning harder and doesn't offer the option of switching it out to a new or different kind of pacifier. You can buy them here. You can get the wubbanub to fit MAM and NUK pacifiers, but you have to use a seem ripper to take out the soothie pacifier (pull pacifier out hard from where it is connected, then use seem ripper to cut thread that attaches to it) then sew pacifier adapter into the spot where you took out the soothie. Then connect pacifier to the pacifier adapter. My Blankee Binkie Size with Pacifier Snap - My son Jacob uses one of these with his mam pacifier. This is what he ended up falling in love with. And I mean in love! He would walk around with it all day if I let him. I have the lightweight velour fabric that is pretty breathable and extremely soft. It is around the size of a washcloth. The pacifier snap fits most pacifiers (not soothie brand) and is extremely high quality. Bunnies by the Baby Silly Buddy- This mainly holds baby's pacifier(which it grips with a velcro hand), rather than keeps it in baby's mouth. It also has a little rattle in it. You can tie the rabbit's arms around things to keep it near baby (i.e. a carseat rail). Washes and dries well on delicate (although it suggests otherwise) and isn't stuffed to keep a young baby safe. You can buy them here. Paci Plushies - These pacifier holders have "hug ring" that attaches to most pacifiers (not the soothie brand). You can take the pacifiers off to wash them or to change to a new one. The angle that the pacifier is held at isn't as good as some others I've tried. Machine washable. You can buy them here. Because I've had a few people ask me, here are two other options that fit mam and nuk pacifiers and are detachable for easy pacifier cleaning: Dr Brown Pacifier Lovey Pacifier Holder and Chicco Pocket Buddies Pacifier Holder. How does the binky attach to he blanket? Amanda, the one my son has above attaches to the blanket with two snaps on the edge of the blanket. They wrap around the pacifier top and snap together. The others have a piece if plastic the pacifier pops into. There are mods for the Wubbanub to fit MAM and NUK. Thanks for letting me know laneyfae. I'll add it above. Can anyone tell me where I could find the link for the Wubbanub which fit NUK? Sorry, I'm not sure where to get it. You may be able to find out on the wubbanub facebook page. I am so glad I found your blog! I am a first time mom and have loved being a mom until now, now that stuff is changing and isnt so cut and dry and i dont know if what i am doing is right or what. I just seem to be losing confidence in what i am doing. 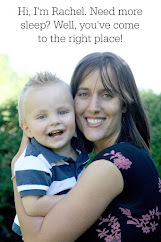 I have been have a bit of problems with my son who is 5.5 months right now and from reading previous posts I think I have most of it sorted out (I just did wake to sleep for a nap time and it worked wonderfully!) Another issue I'm having is an early waking problem causing him to be sleepy at 8 or 8:30 but he still sleeps till 11 (he is on the 4 hour easy schedule from the baby whisperer book) but from what I've read I think I know the answers as to why this is happening. My other problem is swaddling. We use the miracle blanket. I am trying to stop swaddling him but he sleeps sooo much better when he is swaddled partly because when his arms are out he pulls out his soother (which is a wubbanub or any other soother I thought going to a traditional soother might help and it doesn't). I dont know if he is waking at 5 or 530 because its habitual waking or if its because he becomes unswaddled. If I go in ans reswaddle him and give him a soother he falls back asleep till 7 when I go in and wake him. What do you think? Is swaddling becoming a sleep crutch? One last thing is I dont know when I should be feeding him his solids and when I should breastfeed him. The baby whisperer schedule feels like I woild be feeding him all day and I dont know how I could possibly run errands with that schedule. I saw you mention something about this in a previous post and wondered if you could give me some more information. I look forward to hearing from you maybe you could email me instead if you have time. ashleyw215@gmail.com. If you are just having to reswaddle one time a night, it's a toss up about whether or not it's bad enough to drop the swaddle yet. Unswaddling may not even be the morning issue, many babies will go back to sleep if they are given a little attention then. I can't really tell you for sure if swaddling is the issue, you could try going in as a 'wake to sleep' thing and reswaddlig 1-2 hours before the normal waking. I generally do solids and milk together. Before a year I do milk first because that is what I want baby to get most of. If baby isn't into solids at all, I may switch that up for a bit so he'll be hungry enough to try to solids. As baby gets older, I'll do milk then solids three times a day at meal times. with a feed before bed and maybe a snack feed in the afternoon if dinner is later. I don't think you can go too wrong doing it one way or another, but I definitely prefer to do milk and solids together. I'll never understand why she suggested to do this separately when she was so into organization and no snack feeds. I get REALLY behind on emails since my inbox is constantly swamped so I hope a comment here is ok. I snapped it around the mam circle base.